Couples are always looking for new ideas for entertainment at their wedding reception that involves the guests and is a lot of fun. This morning I came across Brittany Watson Jepson’s blog on Etsy. 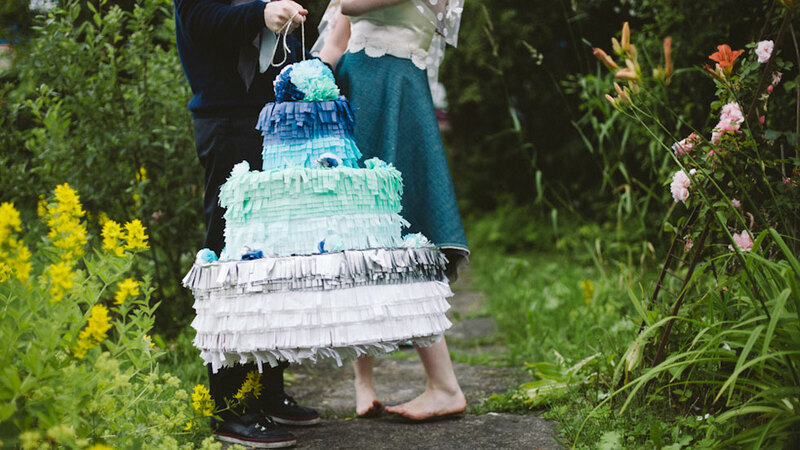 She is a fabulous designer and crafter and has crafted a piñata in the shape of a wedding cake and filled it with fortune cooks. 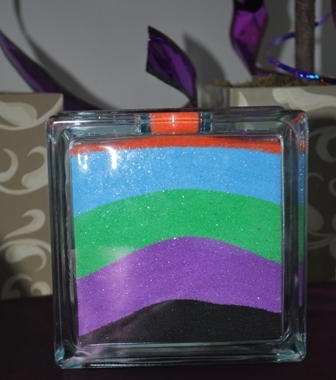 What a great idea and I’m sure you and your guests will have lots of fun with this one! 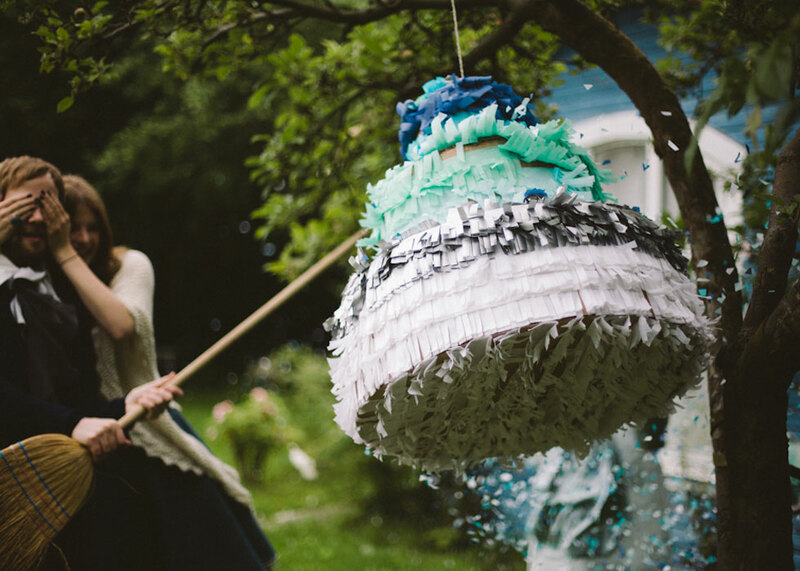 You can find directions to make this piñata at her Etsy site and more of her inspiration on her Pinterest site. 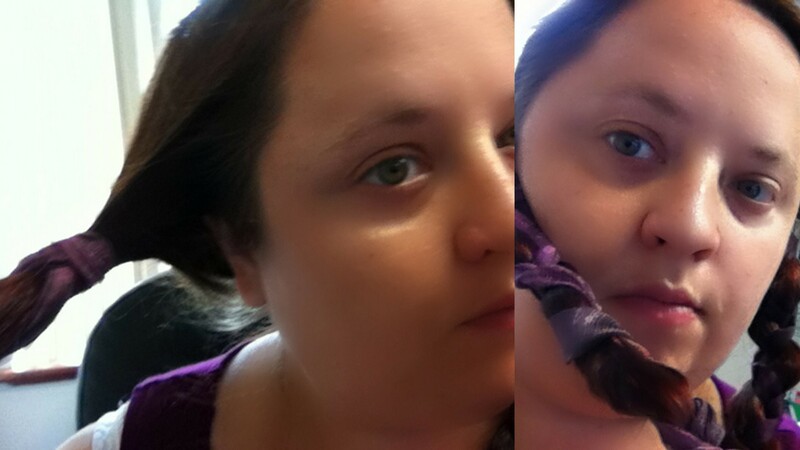 Photos are from her Esty site. Yes . . . that is a 29 week baby bump! I’ve begun to wear my hair in this style simply because I have very long hair and it’s something to do with it. This style is easy, looks nice, and keeps my hair off my neck. I think this would be great for a late 15th century themed wedding, or “Flower Child” like occasion. 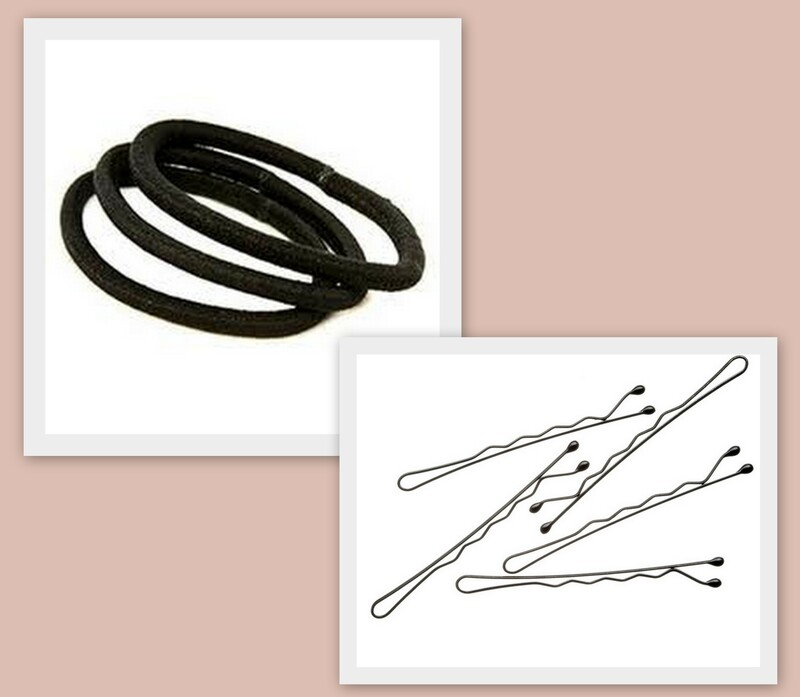 First, you need hair elastics and bobby pins . . . These are only a few that I have . . . they are my “crack”! 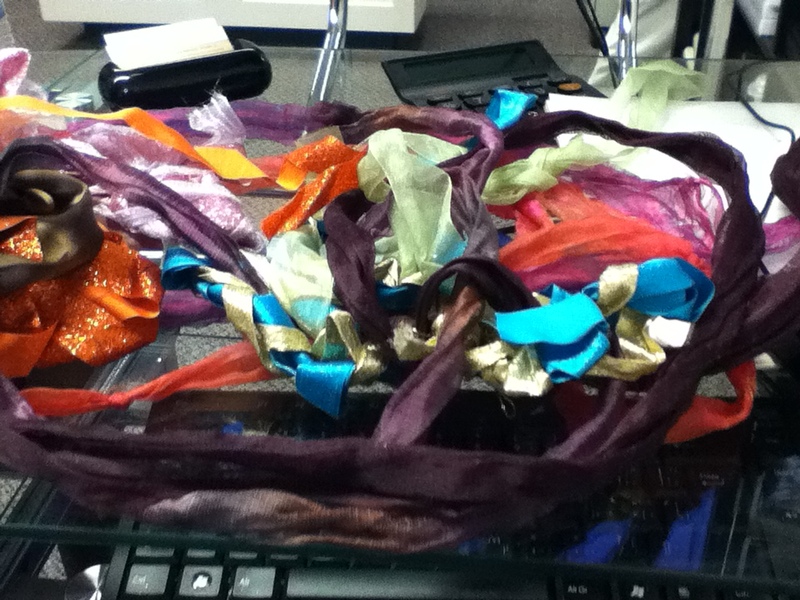 I use many different types of ribbon and it really allows me to get a huge range of looks, one for every outfit! One of my favorite kinds are my homemade ones. I go to Fabricland and other shops on Ottawa St N in Hamilton, ON, and go straight to the most expensive fabrics and ask for the minimum they can give me. That’s usually a few inches, and never costs be more then $5! I then just sew the two sides together, flip it inside out and there you go! See picture below. 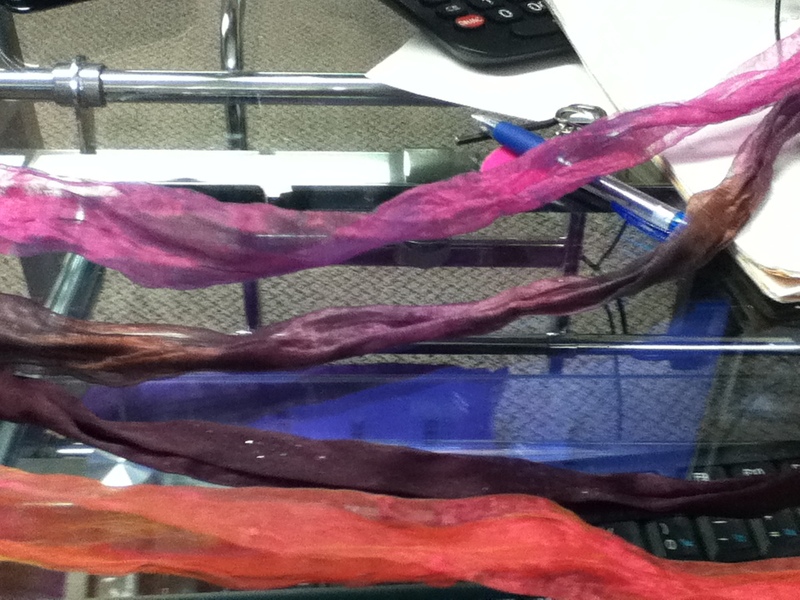 But I also get some nice ribbon from places like Michael’s.They range in price from $1-$10. 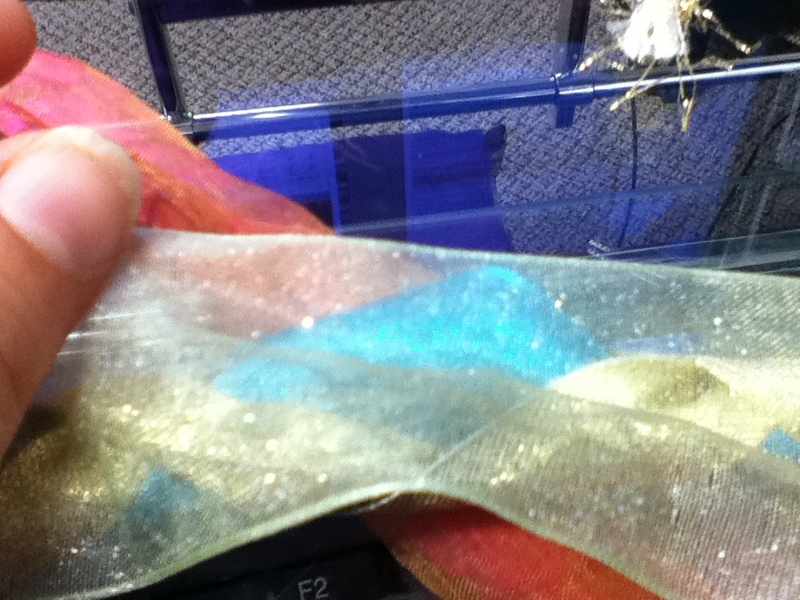 Some are plain fabric and others covered in glitter. Some are sheer.These are great for accents. Weave a glitter one in and then over lap with a sheer one and you can get a real unique look! So, once you have the colours that you want you can start. The first way I’m showing is for long hair. I’ll do a second way for those with shorter hair. So, begin by brushing your hair to one side. I always do it to the left. Why? Not sure, just do. Then, if you want, tie it off. You don’t have to, but depending on the type of ribbon you’re using, it can make it easier to work with. Then take your ribbons and find the middle. 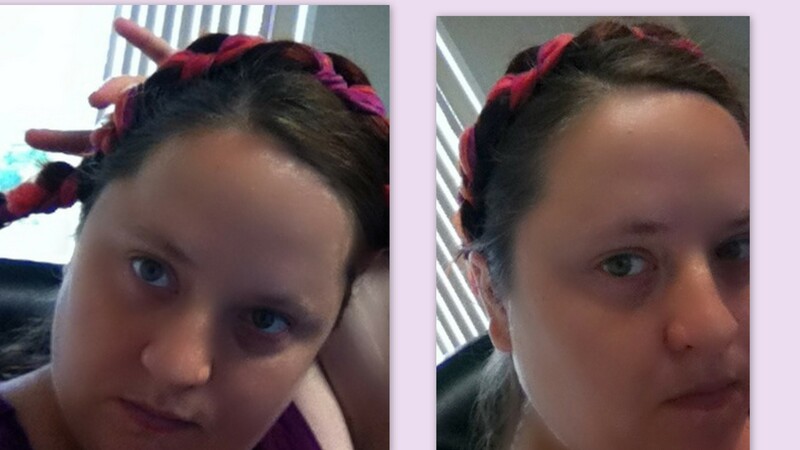 Take the mid point of your ribbons and wrap them over the base of your hair. 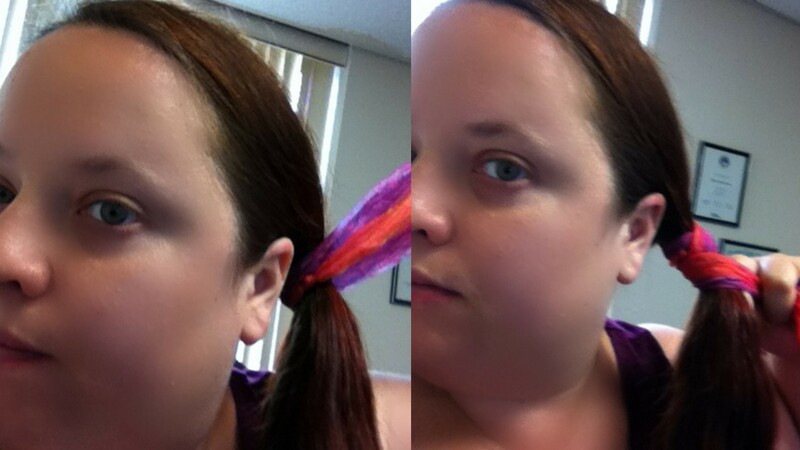 Begin to wrap them around your pony tail as seen here. Keep wrapping the ribbons around. 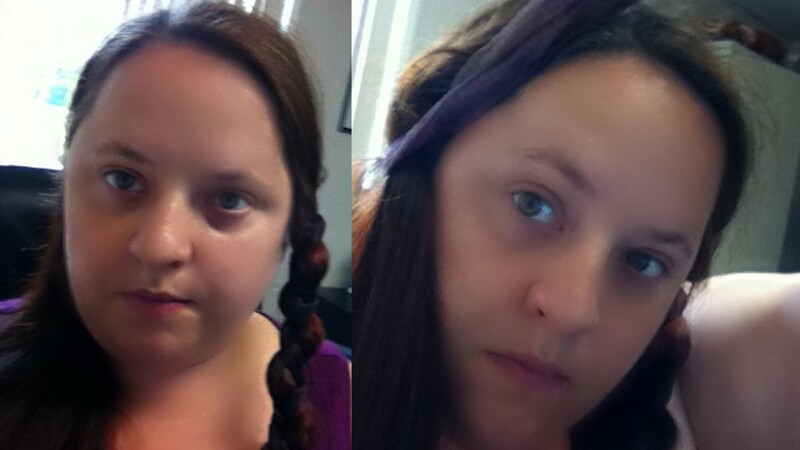 You can wrap them over all your hair or leave bits showing like in these photos. Once you’re at the end you can either put an elastic around the end of the ribbons and braid the rest of your hair if there is more, or braid the ribbons into your hair. It helps that at the end there is hair for the pins to grasp. Pull it over your head. It can be higher up or lower back, whatever you like. 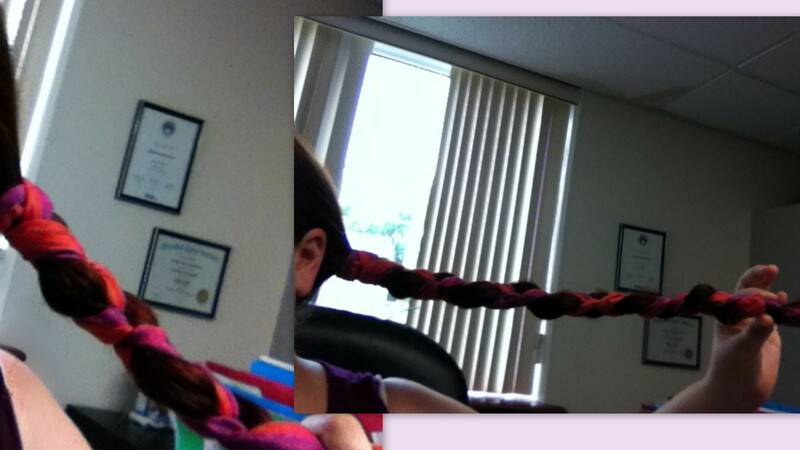 Pin the end of your “braid” to your hair. 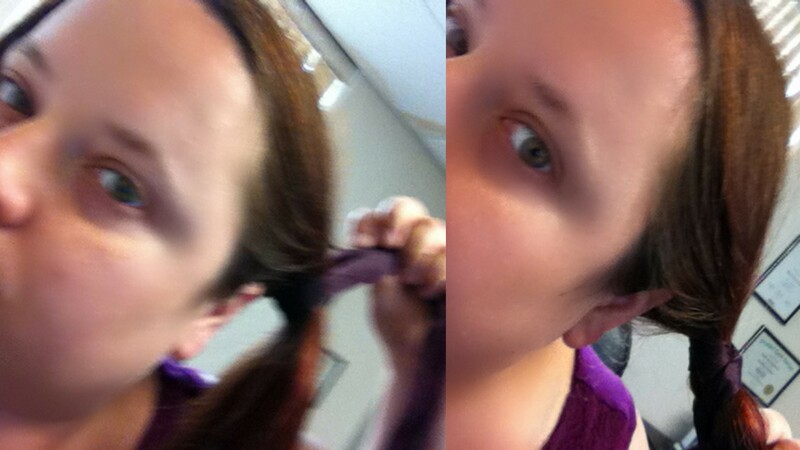 Sometimes it helps to pull some hair over the braid and then pin it. I was able to pin this one with one bobby pin . . . so it’s not hard. And that’s it. If you want, you can add some fabric to the back for a Medieval or Greaco-Roman look. I just tucked this in, but i don’t think it would stay long. I would hot glue some fabric to a comb and attach it into my hair that way. Below is for shorter hair. 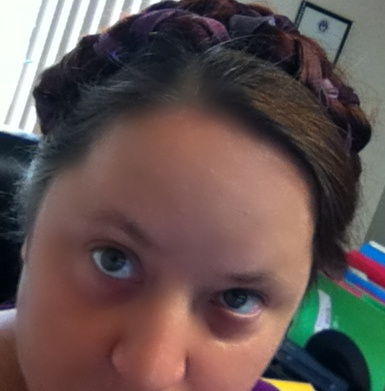 Basically you are doing two braids at either side of your head and folding them over at the top. 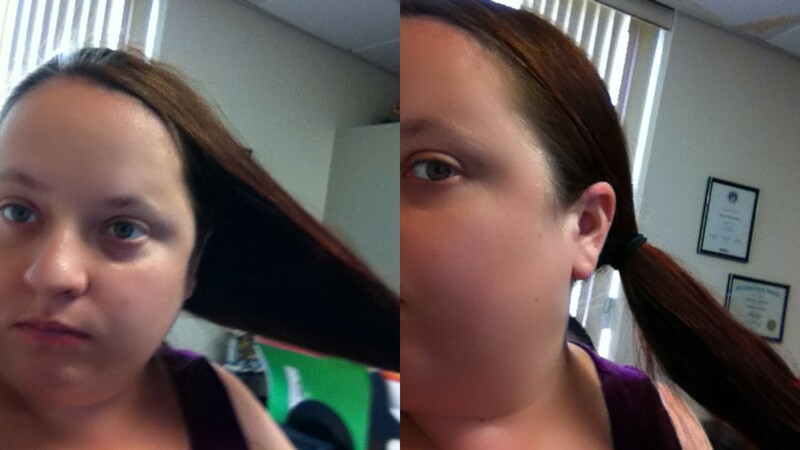 Divide your hair in half and start with one part. As above you can start with an elastic at the base then take ribbon, divided in half, and begin to wrap. When done, tie the base with an elastic and do the other side. Here you can see it slipping a bit, just push the ribbon back up to the base. When done flip one over, and then the other. And pin! And that’s it. I hope you enjoyed this. I love this look and you can work any colours that you may have in your theme into this hair style. It’s great for a theme wedding or if you just like it. 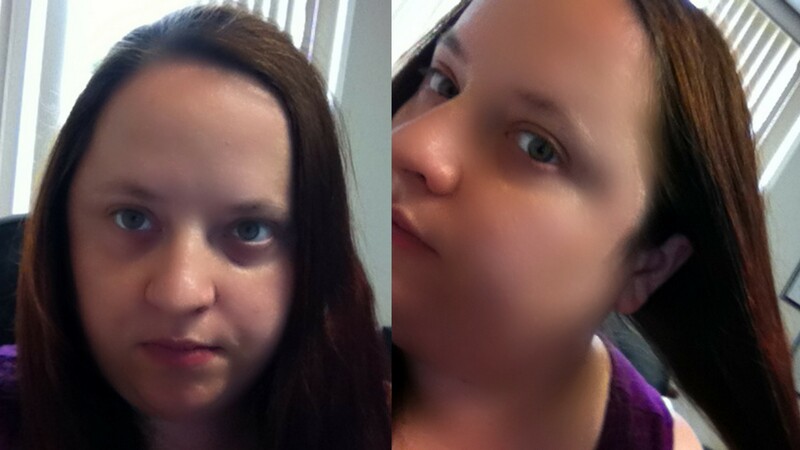 It’s great for summer for there are no curls to fight with and no hair making you hot! Friday the 13th . . . for Weddings?? I can sometimes be a superstitious person. I know it’s silly, but I knock on wood, throw salt over my shoulder. I don’t walk underneath leaders, and when I leave in the morning I touch my Mezuzah three times. However, when it comes to weddings, I find that even the most sensible of people become superstitious, even when they don’t know why these beliefs exist. 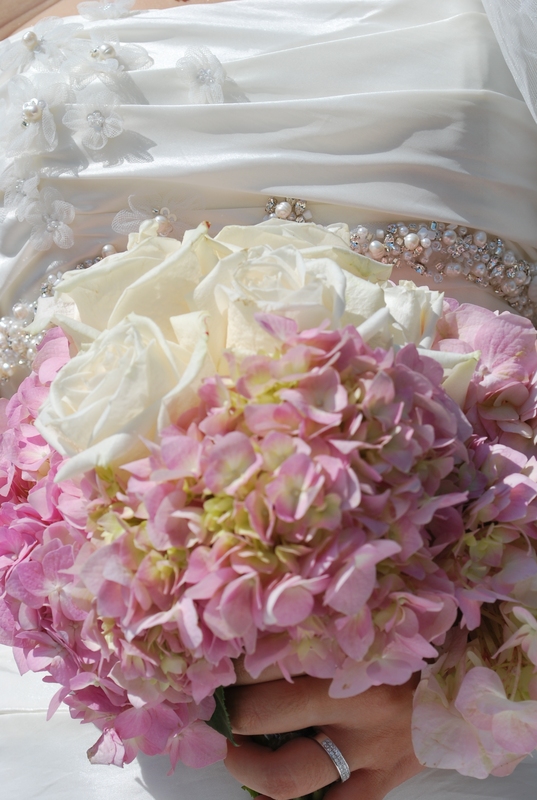 So many, SO MANY brides, still, in 2013 don’t want the groom to see them before the wedding. Sometimes, it’s just because they want how beautiful they look to be a surprise. However, most of the time what I hear is still the old adage that “seeing the bride before the wedding is bad luck”, or “seeing the dress before the wedding is bad luck”. This comes from the time when you didn’t know who you were marrying and the wedding veil come from the same root. I hear brides mention the superstition that rain on their wedding day is good luck (this one I believe). Some people still want to throw rice or confetti over the newly married couple for they see it as a tradition but actually it is an old ritual to bring fertility into the marriage. If you’re a 50 year old widow, I don’t think fertility is an issue in your new marriage! Throwing rice or confetti is something I really don’t recommend. Why? Mainly because someone else has to clean it up and confetti doesn’t biodegrade that quickly. If you want something thrown, may I recommend bird seed? That way it’s safe for birds to eat, and it will be gone in a few days. If someone misses a seed, perhaps there will be a surprise sunflower in a few months time! 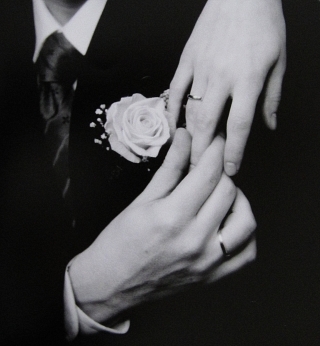 People believe that it is an ancient custom to wear your rings on the fourth finger, left hand. They think that this is true in every culture and think this because someone told them there is a vein running from that finger to their heart. Well guess what, that’s just not true. Go to Europe or in old Jewish families and they wear their wedding rings on the fourth finger on the right hand. 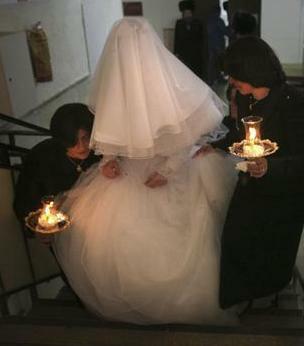 Brides believe that they MUST wear white, even though they are not virgins, or it is their second, third, fourth or beyond wedding. This tradition of wearing white stems (in the western world, not Japan, for that is an old tradition there), from the Victorian era. It is not an “old tradition,” and personally I would LOVE to see the white wedding dress done away with. And there are so many things that we don’t think of any more that are superstitious. How many brides rejoice if they see a spider on their wedding day? I don’t think too many would be happy if a bird pooed on their head! How many wait ’till the bells have stopped ringing to enter the church? Or remove and the replace their wedding ring before they leave the chapel? 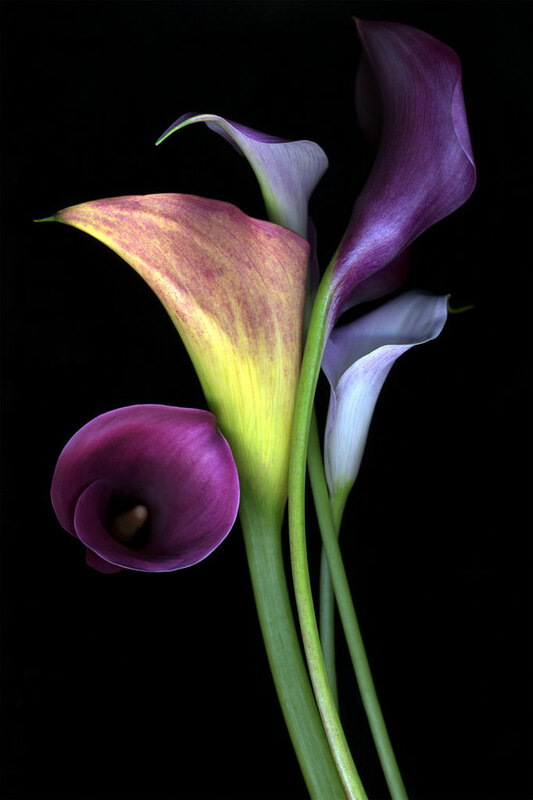 Lillies are associated with funerals, but Calla lilies are probably one of the most popular flowers right now in bridal bouquets! Saturday is said to be an unlucky day to get married on, but I can tell you that is my busy day! 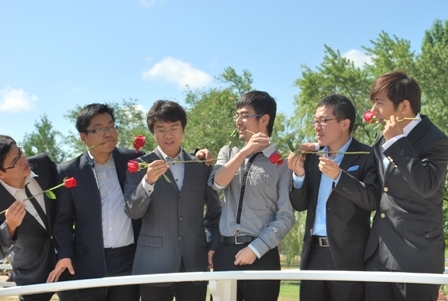 ( It’s become a popular day for weddings because most people have the day off. Have you ever wondered why European royalty don’t get married on a Saturday? It’s because they aren’t middle class and aren’t confined to a work week.) On your wedding day you’re not suppose to see a pig, an open grave or a nun. 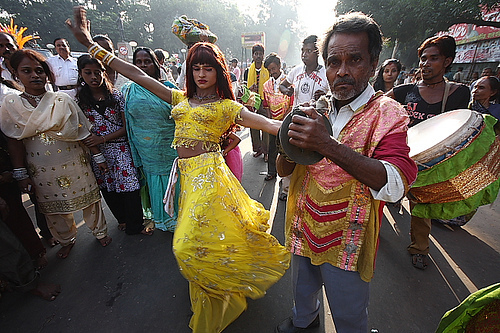 In some parts of India though it’s good luck to see a Hirja – aka hermaphrodite – on your wedding day! The concept of Friday the 13th being unlucky is also a strange concept and many speculate its origin in western supersition. There is little record of this superstition before the 19th century and there are many theories as to why it is considered unlucky. 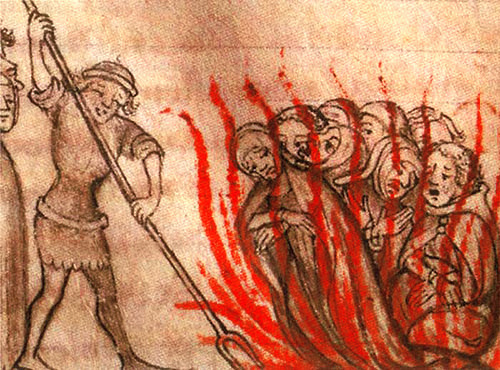 Some people claim that it started when the Knights Templar were arrested and destroyed en masse in France on Friday, October 13, 1307. 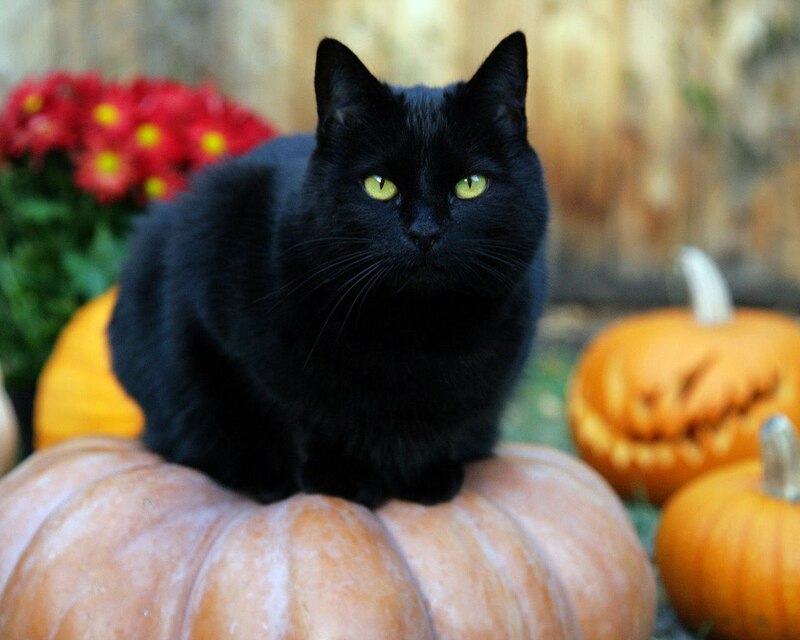 However, there is not much supporting this as the basis for the superstition. But, like so many things, the fear of 13, or Fridays, or them together is not at all universal. 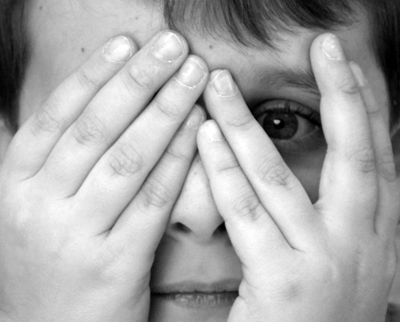 In Spanish countries as well as Greece, Tuesday the 13th is unlucky. In Italy its Friday the 17th. If one were to do the numerology for this year, 2013, it would come to 6: 2+0+1+3 = 6. The number 6 represents home and family – what is better for marriage then that? The number 6 is an important number for it is 3+3 and 3 is a holy number in so many cultures: the Holy Trinity, the Triple-Goddess of Maiden, Mother and Crone, the 3 Fates in Greece, the 3 Norns is Norse Mythology. The Ancient Egyptians had many triads including: Osiris, Isis and Horus and Ptah, Sekhmet and Nefertem. Three is a holy number, and if you multiply it by 2 you get 6, and if you multiply it by 3 even better. This year, 2013, there are two Friday the 13th’s, September 13th and December 13th. Let’s do the numerology! September is the 9th month. That’s perfect! 9+1+3+2+0+1+3 = 19. 1+9 = 10 1+0 = 1. The number 1 is a powerful number: it is the beginning. Is your wedding day not the beginning of a new life together? The number 1 does not let anything limit its potential. Since 1 is the first number, 1 does nothing but grow, and improve. I think getting married on a 1 day is a good day to get married. When you get married is it not 2 becoming one flesh? December 13, 2013 has its own meaning. December is the 12th month, and that does not mean much (except 4 times the power of the number 3! ), but 1+2 = 3. So the number of the month is 3. There is it, that special number again! A pure 3 means communication and interaction. What better for a marriage? However, the true number for this date is: 1+2+1+3+2+0+1+3 = 13! How ironic! Now, as you may have noticed, for the most part, double digits get rounded down, so it’s true number is 4. The number 4 is strong, and capable, dependable, healthy, and trustworthy. Good traits for a marriage, right? I think there is a lot of unnecessary hype around wedding superstitions. I understand why most people who normally never throw salt, or knock on wood get edgy when it comes to their wedding – it is one of the first days of the rest of your life after all. But still, I think that some superstitions have got to go! So don’t be afraid that this year is 2013, and don’t be afraid to get married on a 13th, let alone a Friday. Don’t fall pray to Friggatriskaidekaphobia! I am so convinced that Friday the 13th is a great day that I am offering couples who get married on either of these two dates a discount. SAVE THE TAX!! which, ironically in Ontario is 13%!!! 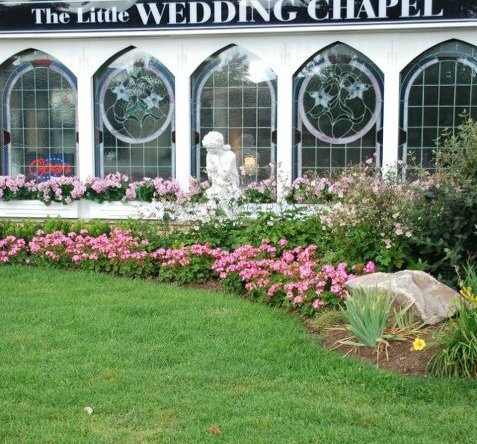 This applies at either of my chapels – the White Wedding Chapel at the Inn or The Little Wedding Chapel on the Lane – a location of your choosing, between Fort Erie and Toronto, Ontario! 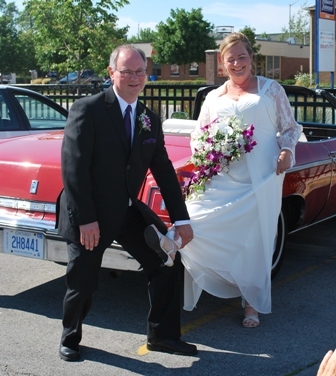 So please, give me a call at 1-800-463-0884 or check us out online at www.niagarafallsweddingworld.com and book now! Friday the 13th can truly be a lucky day! With shows like Murdoch Mysteries and Downton Abbey, the turn of the 20th century is a very popular look for weddings these days, especially for men. The high collar and puff ties of this era do have a certain, ‘je ne sais quoi’, (having a certain something) do they not? But, there is more to getting this look by simply putting a man in a suit, and I have found the perfect website to help you with this! Just be a bit careful when purchasing, for they also have Regency clothing, which is the early 19th century and the look is very different from the late 19th/ early 20th centuries. I will do a blog post on a Regency theme wedding later this year. Left ~ Graydon Wentworth – approx $769.15; Centre ~ Gustave Wagner – approx $474.10; Right ~ J.T Farnsworth – approx $724.60. 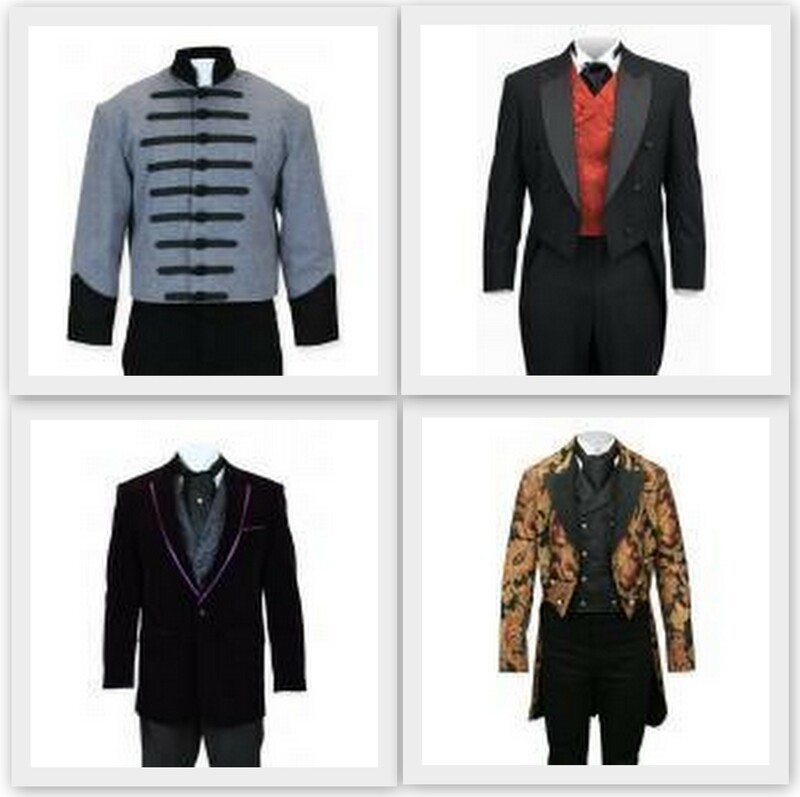 Top left ~Ensign Wool Jacket – $139.95; Top right ~ Victorian Formal Tail Coat – $198.00; Bottom left ~ Velvet Smoking Jacket – $124.95; Bottom right ~ Vienna Brocade Tail Coat ~ $359.95. Left ~ Ambassador – $64.95; Centre ~ Aristocrat (Vienna brocade) – $99.95; Right ~ Brisbane – $49.95. 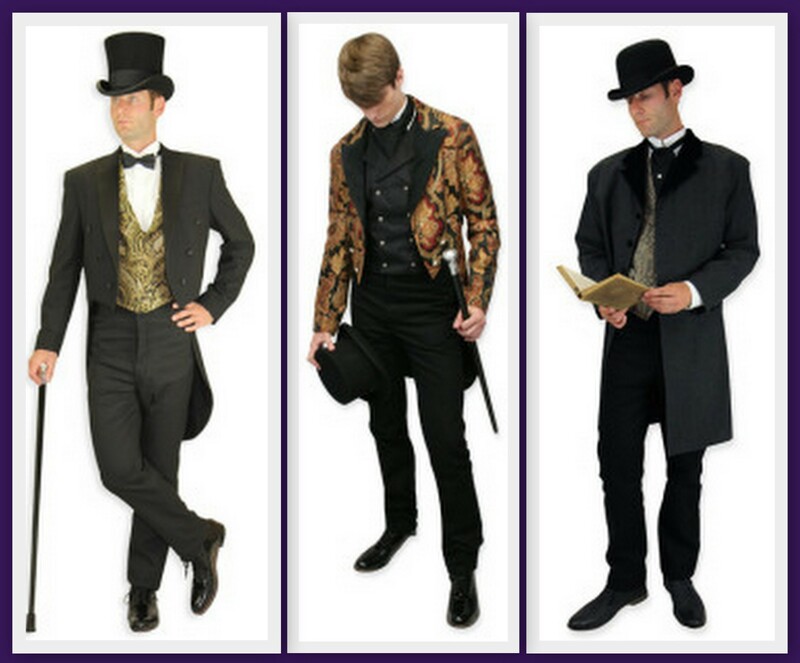 Left ~ Victorian Top Hat, black – $94.95; Centre ~ Slouch Hat, brown – $64.95; Right ~ Tall Derby, brown – $46.95. The most beautiful pocket watches ever!!! Top left ~ Filigree with black pearl finish – $24.95; Top centre ~ Mechanical with Silver Lacy Design – $34.95; Top right ~ antique gold zodiac design – $24.95; Bottom left ~ Mechanical with ornate window, antique gold $39.95; Bottom centre ~ Mechanical with antique gold rotary design – $39.95; Bottom right ~ Sprockets with antique gold design – $24.95. 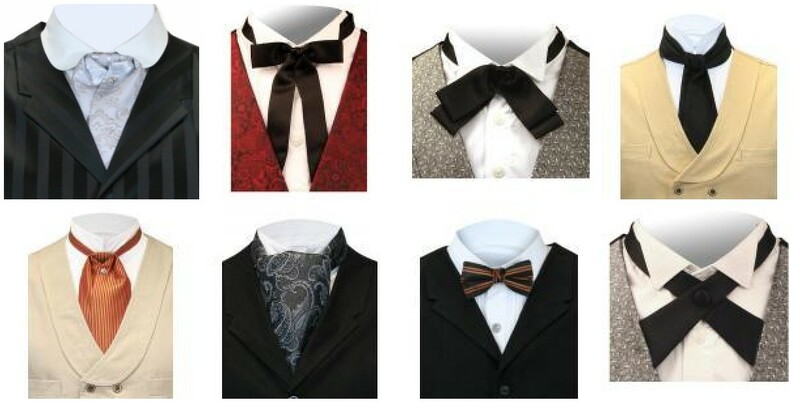 Top row (left to right): Satin Puff Tie ~ Silver $19.95; Deluxe Western Bow Tie ~ Black $19.95; Deluxe Floppy Bow Tie ~$ 19.95; Classic Cotton Cravat ~ Black $19.95. Bottom row (left to right): Satin Puff Tie, Crimson Comstock ~ $19.95; Vivid Paisley Ascot ~ Silver, $19.95; Bow Tie~ Brown Huxley Stripe $9.95; Deluxe Continental Cross Tie ~ $19.95. Left: Glass Handheld Magnifying Monocle with Chain ~ $8.95; Centre: Faceted Diamond Tie Tack ~$9.95; Right: Faceted Deep Sapphire Tie Tack ~$9.95. Left: Jade Tie Tack ~ $14.95; Centre: Mother of Pearl Tie Tack ~$14.95; Right: Tigers Eye Tie Tack ~ $14.95. Left: Compass Walking Stick ~ $39.95; Centre: Filigree Walking Stick, Faux Ivory $39.95; Right: Serpent Walking Stick~ Silver $39.95. Left: Detachable Cotton Collar: Banker ~ $7.95; Centre: Detachable Cotton Collar: High Stand ~ $7.95; Right: Detachable Cotton Collar: Wing Tip ~ $7.95. Wow! A Murdochian Wedding is within reach! Please send me your photos and a write up for me to post on my blog! 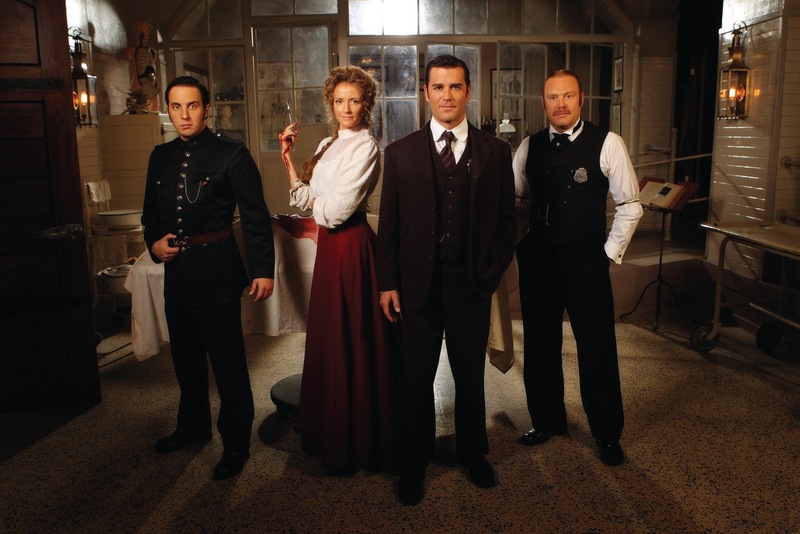 And, I’m currently working on a post focusing on Victorian wear for the ladies and also on turn of the century locations available for weddings and photos, some of which are actually in the show Murdoch Mysteries!!! Today I’m delighted to introduce you to one fabulous eco designer – Valerie Cousens (born in England now a resident of Hamilton, Ontario). Valerie was recently featured in Hamilton Magazine as one of eleven Hamiltonians who have reset their lives. They are called the Dream Team because they have left behind old careers and followed their passions, reinventing themselves. Valerie left behind office and retail life and refocused on the arts, eventually branching into fashion design. Hamilton Magazine columnist Michael Borrelli describes Valerie as a “rehabilitated number cruncher” who found fashion. 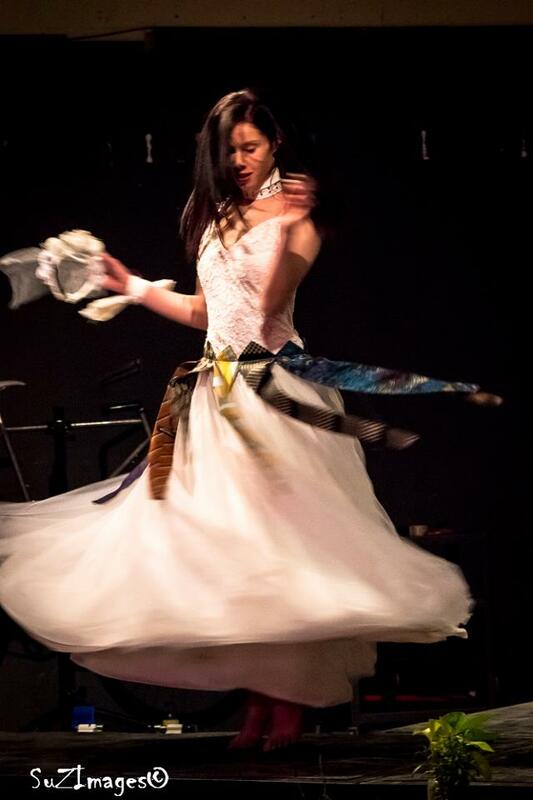 Valerie, who is also an environmentalist, Reiki practitioner, artist and volunteer, describes herself as a “fashion redesigner.” She creates one-of-a-kind, all-recycled, wearable art that is fashionable and affordable. Valerie believes in fashion with a purpose, community outreach and involving youth in her projects.You can find Valerie’s upcycled streetwear and accessories in shops around Hamilton or she will custom design for you. I caught up with Valerie at the recent 10th annual RevWear Fashion Show held in Hamilton, Ontario. I was interested in meeting Valerie because I had been told about her secret upcycled wedding dress! I loved the show and couldn’t wait to see Valerie’s creation. I wasn’t disappointed and had the privilege of meeting Valerie after the show. I’ll describe her design through the pictures below. Valerie, who has no formal fashion design training, found an outdated wedding gown in a second hand shop that would work for her design. 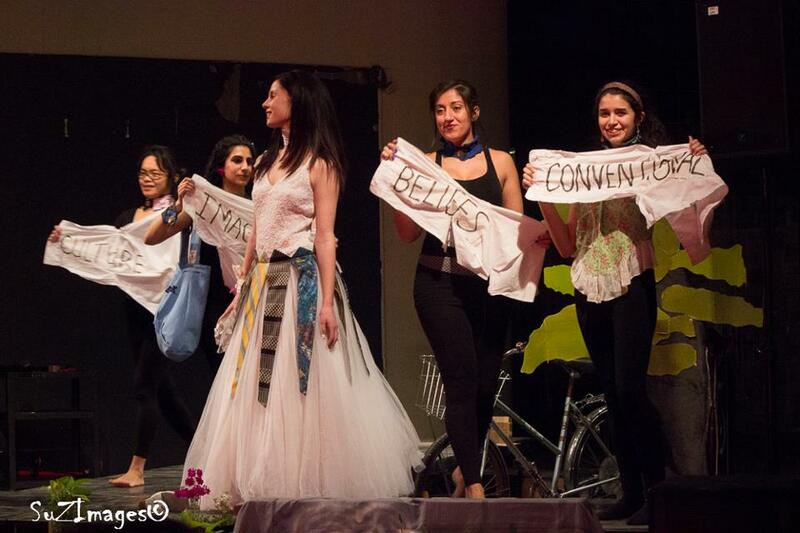 RevWear encourages designers to incorporate a message into their design. 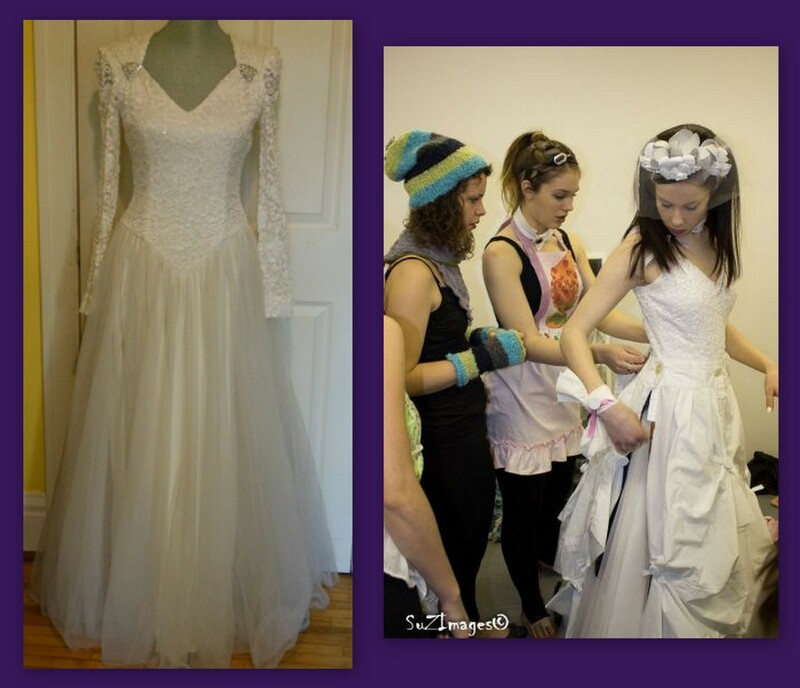 Valerie wants viewers of her creations to know that brides have options when it comes to choosing their wedding dress. They don’t have to buy from traditional suppliers or wear what everyone else is wearing. They do have design options that are unique and beautiful and eco friendly. When model Monica Germaine stepped on to the runway we were all wondering how Valerie would show this dress. 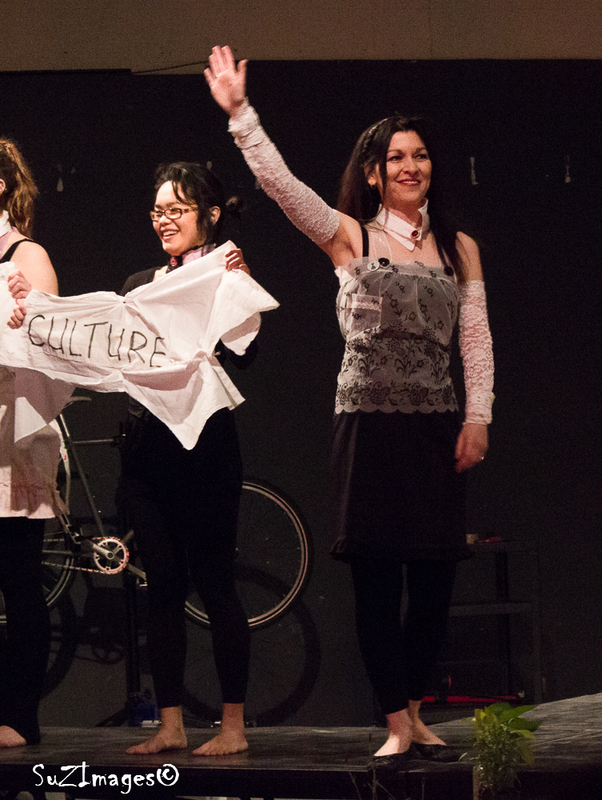 Valerie’s crew took turns unbuttoning each flounce from the dress (made from recycling men’s white cotton dress shirts) to reveal a printed message and an under layer of Valerie’s signature recycling of neckties. Instead of being influenced by culture, belief systems and convention, each flounce encouraged brides to imagine something different: a wedding dress that reflects the care of creation and unique design. Not only was the wedding dress unique but so were the accessories. 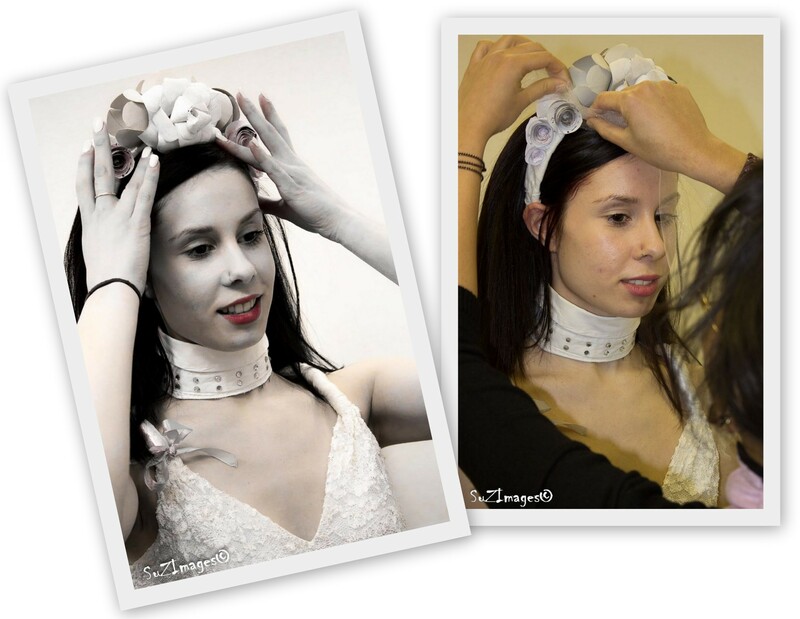 The headpiece was handmade from paper – recycled sheet music to be precise! 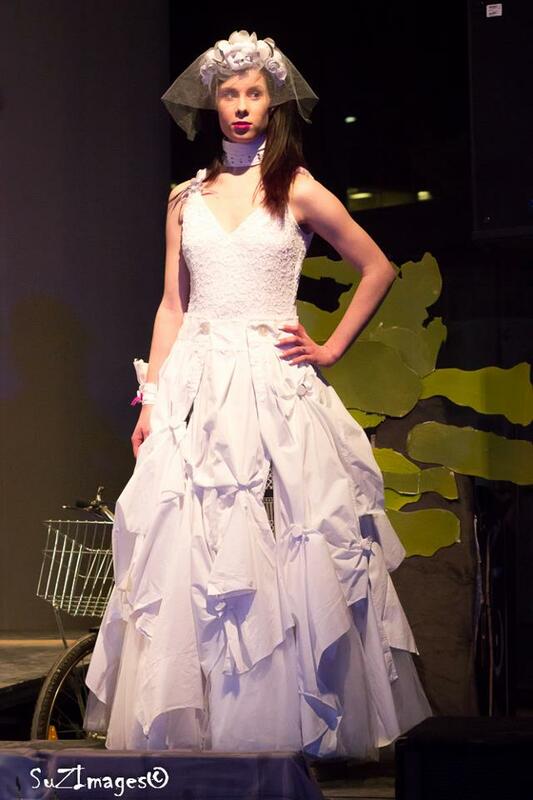 Valerie has created the company Green Dress Designs where you can see more of her upcycled design. Check her out on Facebook too! To contact Valerie call her at 905-522-7679 or email her at cousensv@yahoo.com. The Tudor times are hot, Hot, HOT! With Jonathan Rhys Meyers playing Henry VIII and Natalie Dormer as Anne Boleyn in The Tudors, we can’t seem to get enough of them. And then the movie The Other Boleyn Girl and novels being written about the time period, the Tudors are all up in our faces! This is the time period that followed the War of the Roses in England. A time of great fashion, literature, and philosophy. For a themed wedding, the Tudor period would be great for winter or fall because at this time Europe was going through a mini ice age and it was much colder then it was now or even 200 years ago. The head wear and huge dresses will keep you warm while you party like it’s 1499!!! In this post I want to talk about head wear. The Tudors wore a lot of different hats, so much so that to cover more in one post, well, it would be a very long post indeed! The Tudor Period covered the years 1485-1603 and in this and the next post I’m just going to talk about 1500-1550’s. The late 15th century still looked very much like Medieval times, so please see those posts if that’s what you’re after. 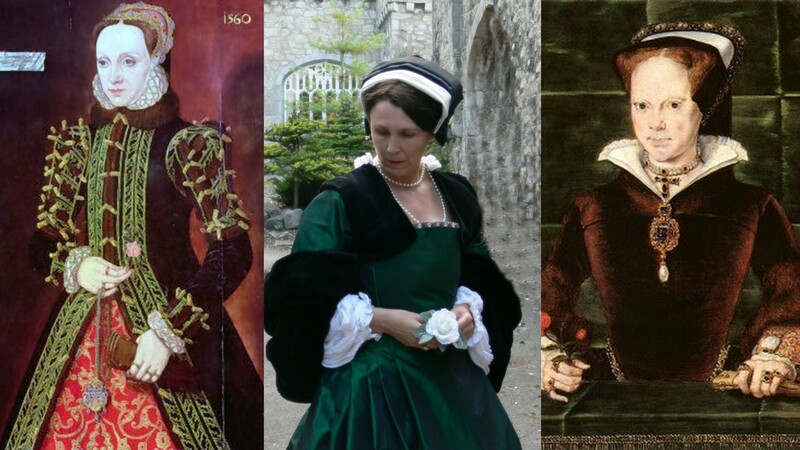 Also, after 1550 the fashion changed a lot. For example, hoods became less fashionable. After 1558, when Elizabeth I ascended the throne, the time became known as the Elizabethan Era, even though it was still Tudor times. You can see how time periods tend to overlap as they evolve. So, in the future I will do an Elizabethan period post. Please look for that! Head wear, until recently in our society, was vital for a proper woman. 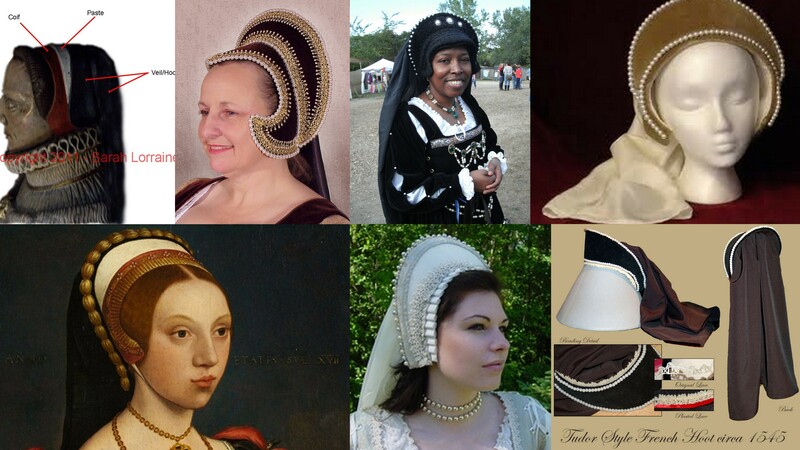 In Tudor times it was still expected that most women would have their hair covered, or mostly covered, at all times. If a woman went with her head uncovered it was considered improper, immodest and one could even have been considered a prostitute. And one of the most iconic head wear from this time period is the Hood. 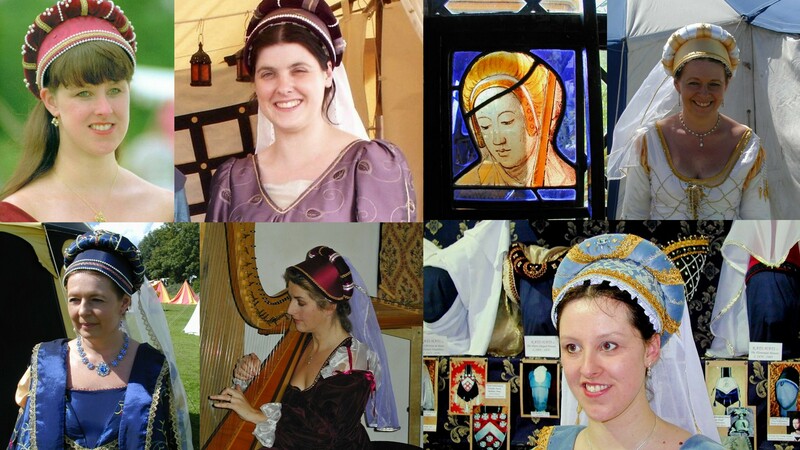 Pictured above starting top left: early Flemish Hood c1453-1510 from Kats Hats; Katherine Parr/Katharine of Aragon C1530’s Gable Hood; Anne Boleyn in French Hood c1530’s; Elizabeth of York: this is an example of an early Gable Hood, c1500; Gable hood from Kats Hats; a wonderful bridal example of an early Flemish Hood c1453-1510 from Kats Hats; Queen Mary 1st, c1544 French Hood; Gable Hood c1520’s. Thank you to http://www.kats-hats.co.uk/flemishhood.shtml for these pics of Flemish Hoods! Flemish Hoods, also known as steuchein, were the first hoods of this style. As their name suggests they originated in the Flemish lands, now known as Belgium. A Flemish Hood is an off shoot of a Hennin, which I talked about in my post Medieval Women’s Apparel. This hood morphed into a more turban look with the turbans coming into fashion following the Ottoman take over of Constantinople in 1453. *please be aware the term Flemish Hood also refers to a few different head wears, coming from Flanders. This hood was so popular that it was worn by women from all backgrounds of society; poor and rich alike loved it! From the lowlands this look spread into the rest of Europe and began to morph into what became known as the French Hood. 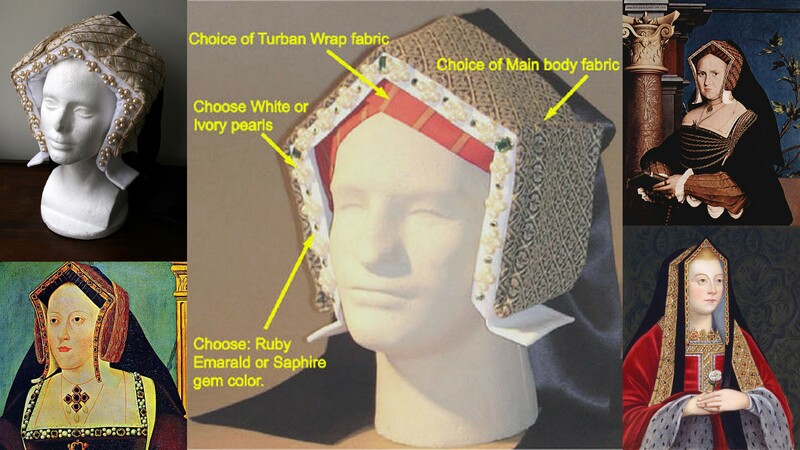 The French Hood was made popular by Anne of Brittany in the 1490s and came into fashion in England when Anne Boleyn brought it to the English Court after spending time in France (around the 1520s). It does look very similar to the Flemish Hood, but without the back turban. 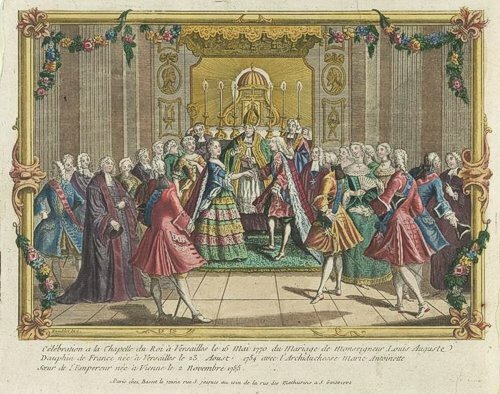 As pictured above, a French Hood consists of the following different parts: Coif and/or Crepine, Paste, Veil, Billaments and a Cornet aka Bongrace. In the early stages it was worn further to the top of one’s head. But as time and fashion changed it moved to the back, showing more hair and becoming more ornate. When Henry VIII married Jane Symore the French Hood disappeared from the English scene. But once Jane died the hood came back and was worn right up until the 1560’s. The French Hood has a few variations such as the Flat Hood (pictured below) and was worn by Queen Mary l (as in Bloody Mary!!). Then there was the Artifit, another flat hood, which is heart shaped. Shown below from The Tudors. The Gable Hood, which is my favourites and pictured below, was popular in England from the beginning of the 16th century to the middle of the century. It was first worn by Elizabeth of York, Queen of Henry VII and mother of Henry VIII. It was also made popular by Catharine of Aragon, the 1st wife of Henry VIII. It fell from favour when Anne Boleyn became Queen as she preferred the French Hood. With Jane Symor the Gable Hood made a come back. Unlike the French or Flemish Hood which can sit at the back of the head, the Gable Hood is worn near the front. The early style of this was simple, a veil that had long lappets, or side panels that would reach down to the shoulders. However, as time passed it, became more of a structure with Buckram fabric (a stiff cloth made from cotton or linen, sometimes used to cover books) to make the front and a box shaped back. The veil consisted of two pieces of fabric that were sewn as tubes and hung at a 90 degree angle. The side lapels shrunk from shoulder length to above the chin by the middle of the 1500’s. By the 1560’s it has fallen out of fashion like most hoods and disappeared from the heads of fashionable ladies. Pictured above from left to right: A Gable Hood from etsy; pictures of Gable Hoods from Kats Hats and Fyne Hats and also a site to make your own Gable Hood! The Snood is something that has always been popular and in almost any time period. It was popular in the 1940’s, the 1890’s and in the 15th century and even further back in time (according to Wikiipedia the first time the word Snood was used in the English language was in 725. Imagine how much older the look itself must be!). The Snood looks good and can be functional. You may recognize it as a simple hairnet worn today for hygiene in food services or worn by women in the armed forces to keep their hair in place. However, in the Tudor times it was not a workplace necessity but something that could be made quite lovely. It is just netting made from almost any fabric. 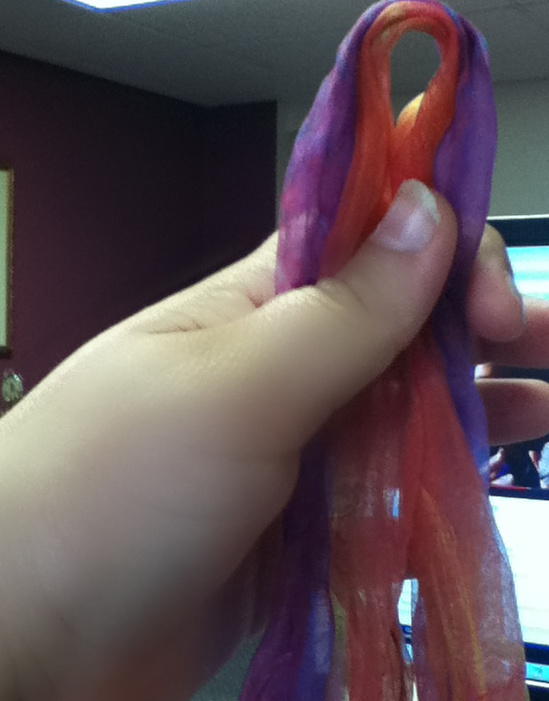 It can be made with thick fabric like yarn or ribbon to finer thread. 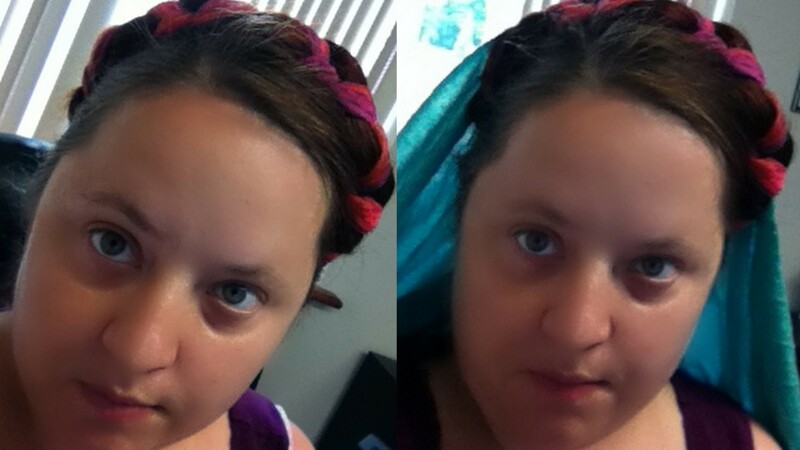 The Snood can have accessories like beads or even pearls woven into it while being made. 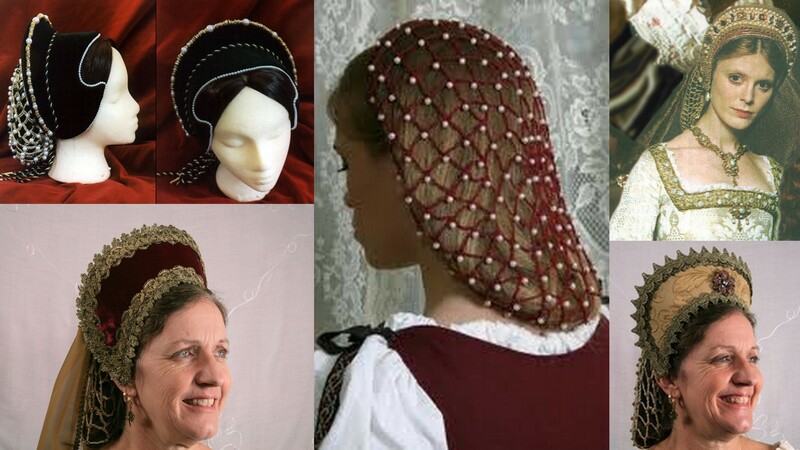 In the Tudor times it could be worn plain or attached to the top part of a hood, with or with out the veil. 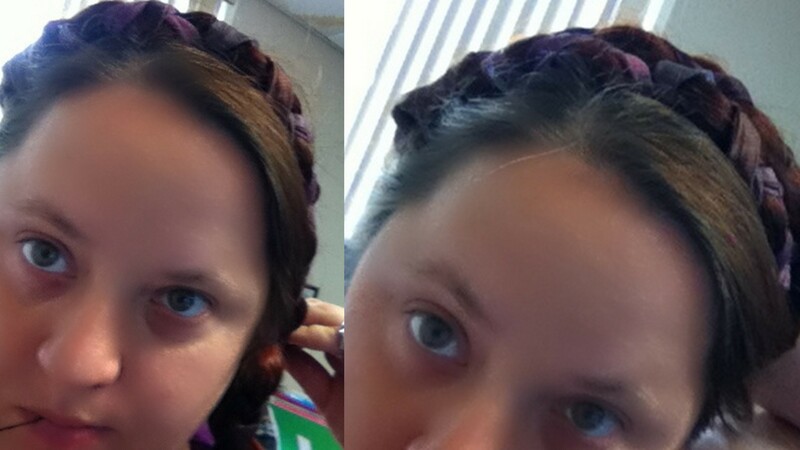 In closing, you can get a great Tudor times look with a simple headband and veil attached. Here is a link to check out. You can buy or probably even make one of these easily. These would be great for guests if you want eveyone in costume, for they can be bought pretty cheap and made even cheaper! 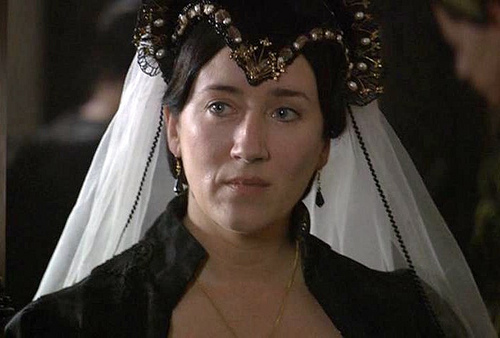 I hope you liked this post and found it helpful for planning a Tudor wedding. 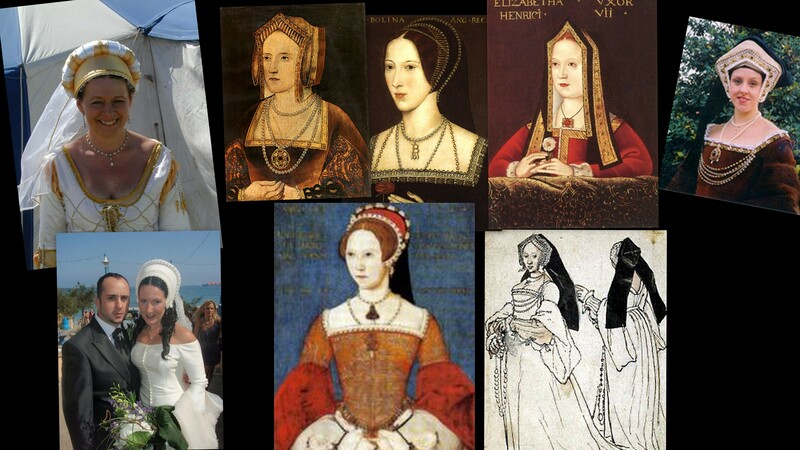 I’ll soon have a post ready all about dresses for your Tudor style wedding. Your reception offers so many opportunities to bring out the Medieval gal in you; from the menu and place settings to the entertainment, there are lots of ways to work your theme into your reception. You can turn any location into a medieval hall. Banners with family crests or Coat of Arms can be ordered and hung behind the head table. You can plaster your Coat of Arms all over: on plates that are special order, glasses that the guests can take home, even on your man, (remember the surcoats?). You can use your Coat of Arms on the menu and the invitations. Designing a Coat of Arms is not as hard as it sounds and is a great way to not only decorate for your medieval wedding feast but a way to integrate your two families. 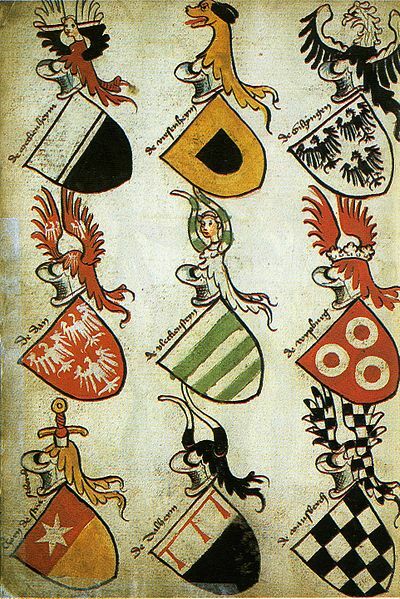 A Coat of Arms can be as simple as a cut piece of cloth with geometric shapes to very complex designs with animals and metaphoric symbolism. 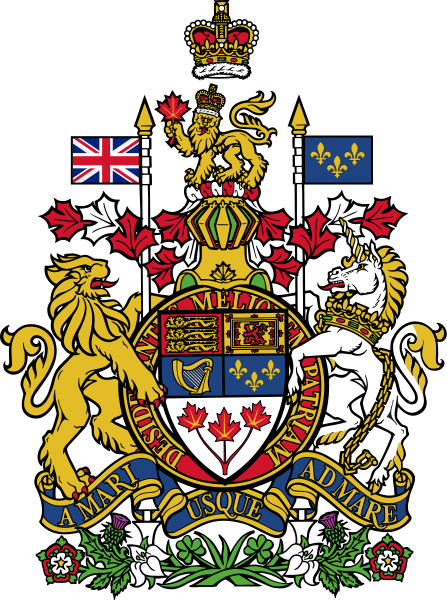 Consider the Canadian Coat of Arms as an example. In the picture below you’ll see many symbols that are identified with Canada such as the maple leaf and our French and British heritage. There are also symbols that identify us with Britain such as the crown, lions, and unicorns, all symbols from the British Coat of Arms. As you think about designing a Coat of Arms for your wedding day, consider things such as where you came from and your ancestry. If you are of African descent consider a lion or some other animal for the content or even an African mask. If you are Japanese perhaps place a samurai helmet on top of the shield or add the chrysanthemum from the Japanese Coat of Arms. 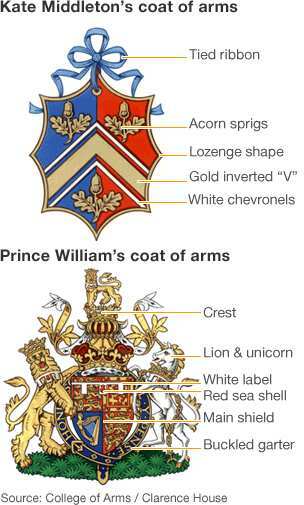 When Kate Middleton married Prince William a Coat of Arms was created for her. 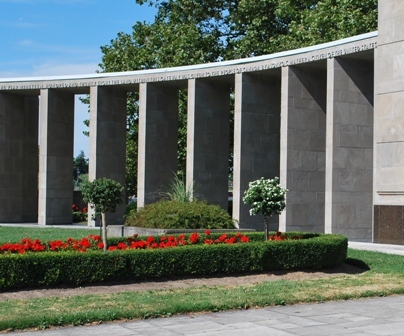 Consider using flowers, animals or flags representing what you love or your ancestry. 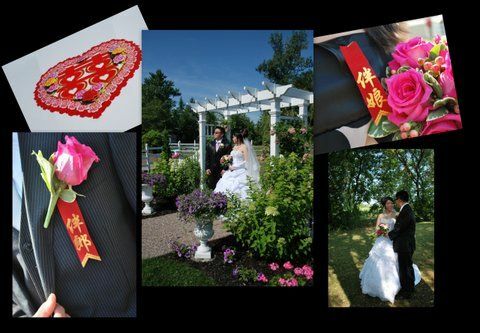 If Mike and I had done this for our wedding it would have included the symbols below. Our Coat of Arms would probably have been flanked by a bear and a moose with Latvian, Welsh and German flags. For flowers Mike would have included a Rose of Sharon as that’s his favourite flower. I would have included Monkshood as that is my favourite. 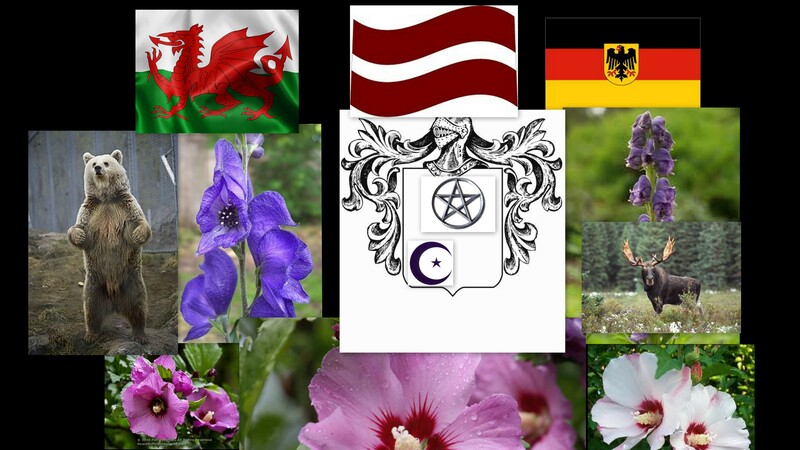 If you feel stuck go to Make Your Coat of Arms or All Family Crests for ideas. Wooden tables – preferably a few very long rectangular ones if possible. Forks and knives – have them off to the side in case anyone wants them, but forks where not used until the Renaisance period. Washing bowls – have them readily available between courses especially for those guests who choose to eat with their hands. Soap is good but you can also add some lavender as well to scent the water. Make sure that you also have towels for drying! Candles – keep the lights low and have a lot of candles. 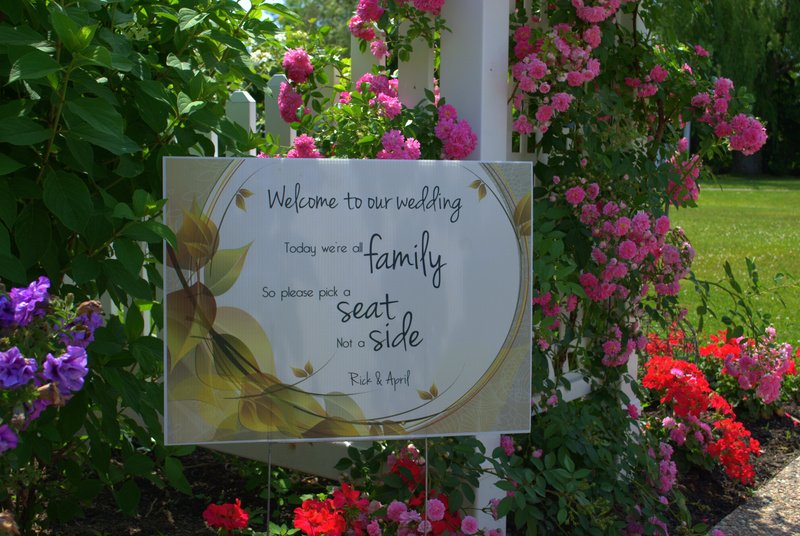 A great way to make your reception authentic is the menu itself. 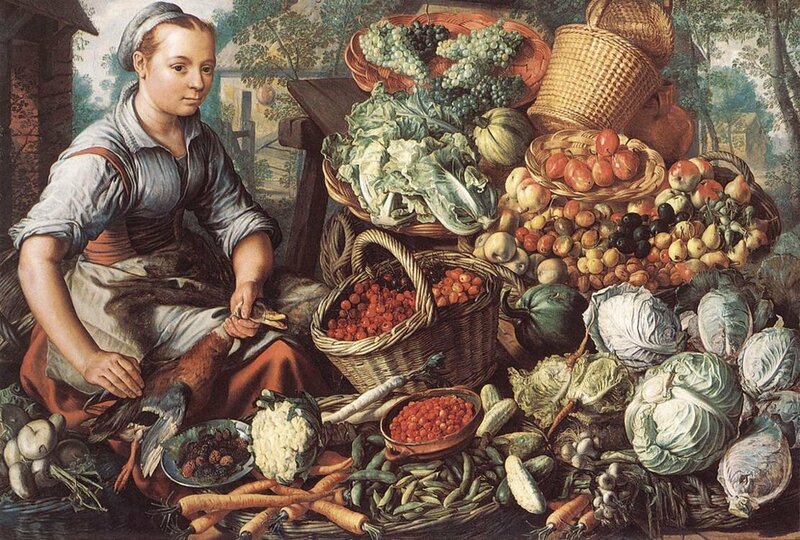 Medieval food is a bit different than the food we eat today as different foods were available. 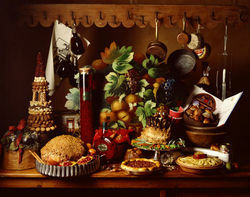 For example, potatoes and tomatoes were not part of European cuisine. Potatoes were only introduced to Europe in late 16th century. Tomatoes were another introduction following the Spanish conquest of the America and were popular in Europe by the end of the 17th century. Appetizers: oysters, mussles, bread and butter, cheeses, tiny meat pies. Salads: these were eaten in Medieval times but without tomatoes. Consider a salad of fresh spring greens with a vinaigrette dressing with berries. Soups and Stews: these were very popular, but again, they did not include potatoes or tomatoes. Ingredients can include turnip, parsnip, carrots (but not orange carrots as those didn’t exist until the 17th century), herbs and barley. You can add meat like mutton, fish, pork and chicken. Haggis is always a classic as are meat and vegetable pot pies. Roasted meat like pig, goose/duck, lamb/mutton, whole fish, rabbit or hare and for dessert things like fresh fruit, apples or pears poached in wine are delicious. As you plan your Medieval meal I suggest you read this article on Medieval Cuisine. In fact, I strongly recommend that you read it thoroughly before you start your planning! I found a couple of Medieval menus online that are quite informative. You can still have modern entertainment like a DJ or band for dancing but perhaps consider live Medieval music during the dinner. Harpists and lute players were probably the main event at a Medieval Feast. Not only did they provide music but they also told stories. Nowadays most musicians don’t do both but I’ve provided some information on harpists and story tellers that you could convince to work together to provide some Medieval entertainment. Consider traditional stories like the Arthurian legends, The Tale of Gawain and the Green Knight, and the Canterbury Tales. Locally there is Niagara Harpist and Durham Folklore Story Tellers. A whole host of entertainers can be found on Gig Salad or try Canadian Viol Players. Jesters are a classic symbol of Medieval entertainment. They were jugglers, stand up comedians and clowns all rolled into one. I tried so hard to find an actual jester in Ontario with no luck. However, you can hire clowns and magicians to play the same rolls. Maybe you can even convince them to dress in costume! Here are a few available companies: Checkers Fun Factory Inc., Dotsy’s Entertainment Company and Costume Shop, and Happy Time Clowns. And finally, the location. Fortunately you can make any location, from a hotel to a church hall, have a “Medieval” feel but here are some links to places that already have that feel. Berkeley Events in Toronto has a lovely space for a Medieval wedding. 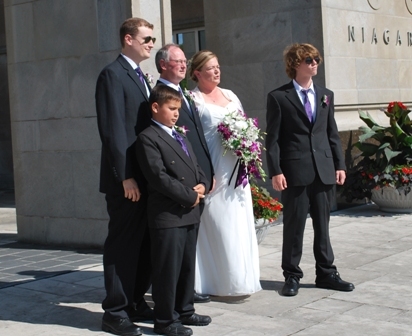 Elsie Perrin Williams Estate in London, Ontario is a beautiful spot. 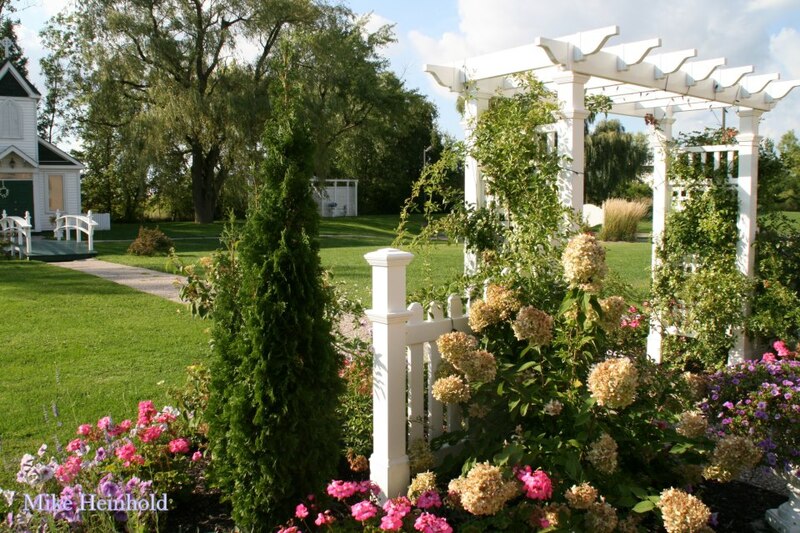 The Ancaster Mill in Ancaster (Hamilton) has a lovely waterfall and grounds to add to your wedding. The Knoll Wood Golf and Country Club, Ancaster, has a fabulous outdoor fireplace for ceremonies. The Paletta Mansion in Burlington is stunning. The Scottish Rite in Hamilton is very picturesque with lovely grounds. The Stone Mill Inn in St. Catharines has beautiful suites and stone floors. The Hart House in Toronto has great architecture and old world charm. Another beautiful venue in Toronto is Casa Loma. Check out the many sites on Event Source. If you live in the United States there is the fun Medieval Faire in Ohio. I hope you enjoyed my Medieval Themed Wedding posts and I look forward to writing about different theme weddings. If anyone wants me to write on a theme, please email me at lwc@cogeco.net. Some ideas I’m considering are: Roman, Egyptian, Renaissance, 1920’s, and Halloween. See you soon and all the best! 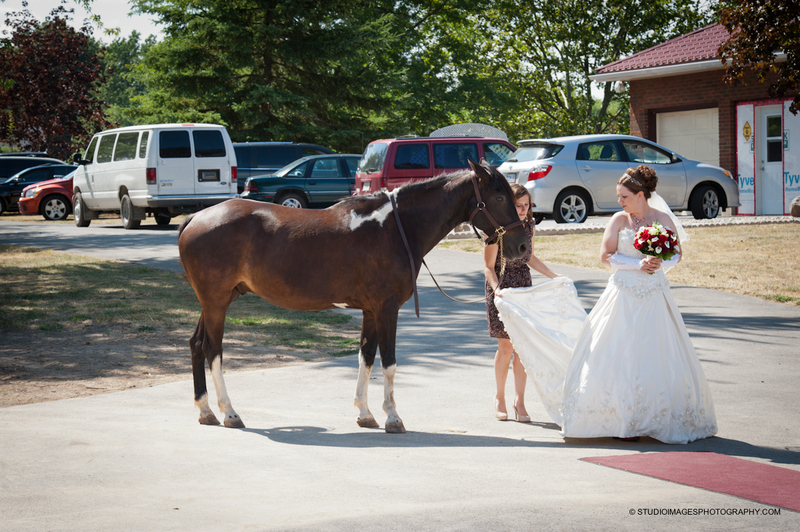 We did some fabulous weddings this past weekend! No shortage of creativity for sure on this very busy weekend. I thought I would share a few photos from some of them, they were so much fun and great couples to work with and be part of their big day! 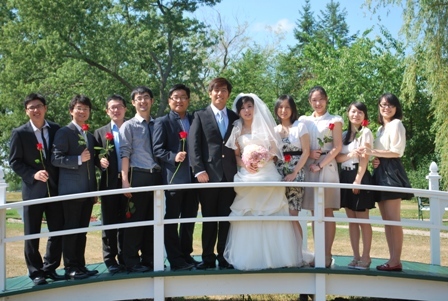 Yogi and La-Ling were married at The White Wedding Chapel in Niagara Falls, Ontario and posed in the beautiful gazebo in the chapel garden. 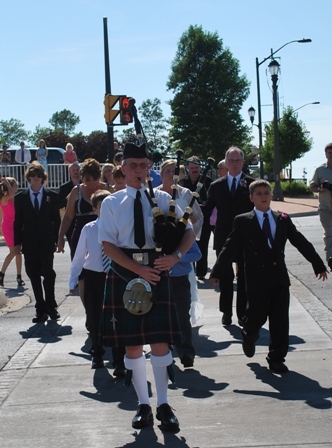 Deborah and Stephen were married and had their reception/dinner at The Royal Canadian Legion – Frontier Branch in Fort Erie, Ontario and were piped to the Mather Arch Park for picture taking.Their ceremony included a Sand Ceremony which involved themselves and the children along with a Family Blessing at the end. 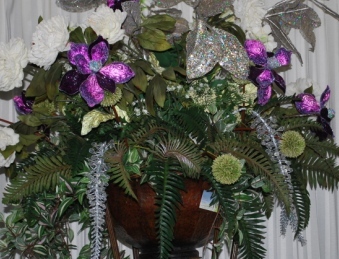 The Wedding Planner and decorator was Linda from JUST-N-LOVE. 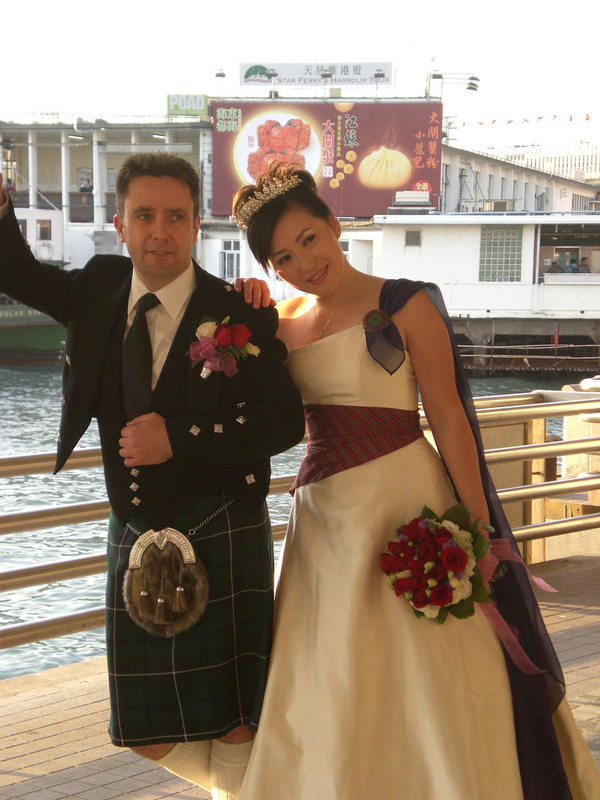 Shujie and Yang came with several of their friends to The White Wedding Chapel to be married and had a great time posing for pictures on The Bridge. 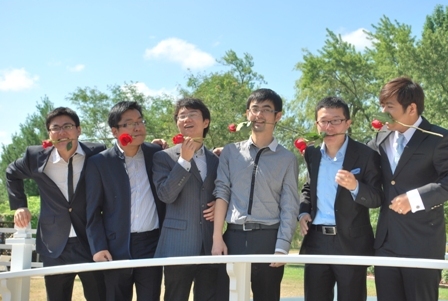 Qian and Xue incorporated some elements of their Chinese culture into their ceremony at the White Wedding Chapel. 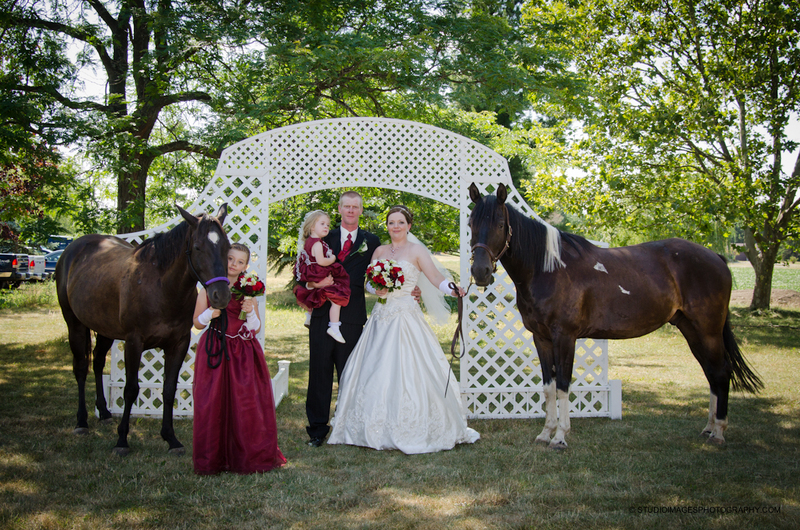 John and Tami got married on a farm in Pelham and celebrate with their children and their horses! 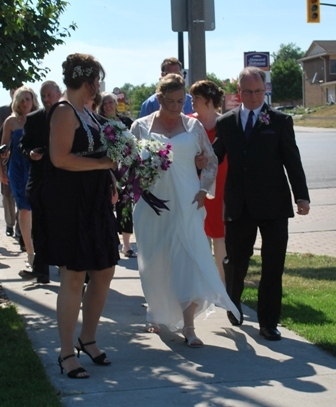 Many wonderful weddings this past week. 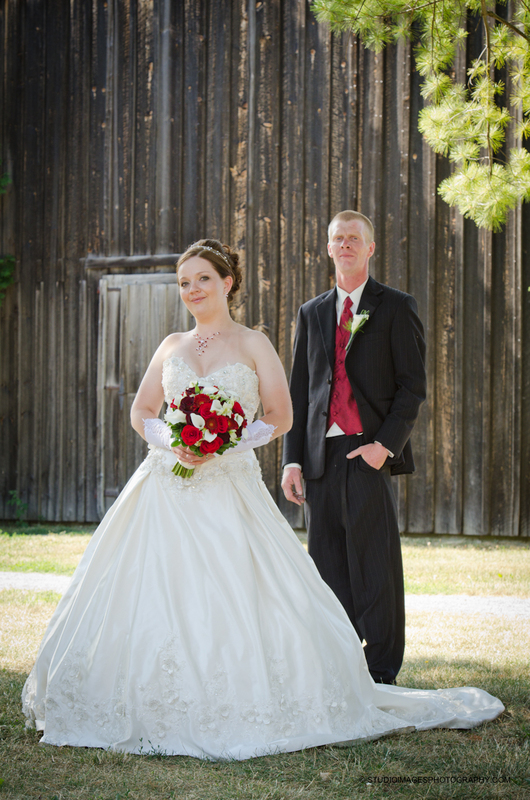 If you’d like to get your summer time wedding on my blog please email me. See details on the Contact Us page. I promised you the third part of the Medieval Theme Wedding Trilogy this week but as it happens it is the height of wedding season and my post on venues for a Medieval ceremony and reception is taking longer than I anticipated! My apologies! 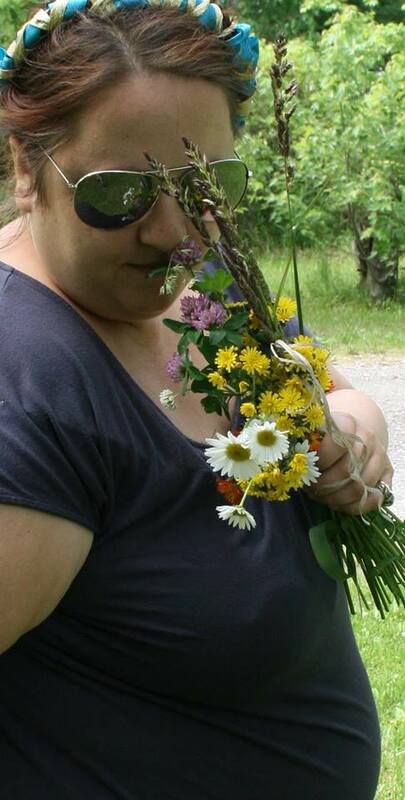 And I very much dislike going a week without a post so I thought that while you patiently wait for the 3rd part of the Medieval Trilogy I would share a unique wedding with you that happened this past weekend in Hamilton, Ontario. It was a “groomzilla” wedding! Apparently Shannon Van Rompaey let yer fiancee Matt Shepley plan their wedding! Wow, she must have complete trust in him! Actually it wasn’t difficult to trust him because they are both diehard Hamilton Tiger-Cats fans and season ticket holders. Ladies, don’t think that Shannon was impressed when Matt woke her early one morning with his idea. It’s not like Shannon said, “You go boy!” Matt had to do a lot of convincing but he was pumped that the Ti-Cats would be playing the Argos in Hamilton in July and that a tent, tables, chairs and food were a definite possibility! Since neither Shannon nor Matt wanted a cookie-cutter wedding it didn’t take long for Shannon and the rest of the wedding party to come along with the idea. And it was an easy theme to carry through the wedding. The bridesmaids, dressed in black and gold, carried pompoms instead of bouquets and the ring bearer carried a football pillow. Their invitations looked like football tickets and their recpetion took place in the end zone VIP tents where they watched the game in matching football jerseys. What an experience it was for them and their guests especially when the Cats beat the Argos 36-27! Thanks to the Hamilton Spectator for the great article in Monday morning’s paper and for the photo below! 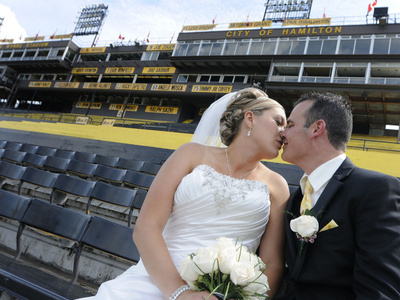 Shannon Van Rompaey and Matt Shepley tie the knot at Ivor Wynne Stadium in Hamilton and then watch the Ti-Cats beat the Argos 37-26.